Visual Studio Code>Other>Todo+New to Visual Studio Code? Get it now. Manage todo lists with ease. Powerful, easy to use and customizable. View the demo. "todo.timer.statusbar.alignment": "left", // Should the item be placed to the left or right? "todo.statistics.statusbar.alignment": "left", // Should the item be placed to the left or right? "todo.embedded.view.icons": true // Show icons next to todos and types"
Changing some settings (symbols, colors, providers...) requires a restart. An actual regex will be generated from the value of the todo.embedded.regex setting. It uses 2 capturing groups, the first one captures the type of the todo (TODO, FIXME etc.) and the second one captures an optional description (TODO: description). ag and rg will use their specific regexes for finding the lines containing embedded todos, then those lines will be searched in using the regex defined under todo.embedded.regex. The following tokens can be used in todo.statistics.project.text, todo.statistics.statusbar.text and todo.statistics.statusbar.tooltip, they will be replaced with the value they represent. 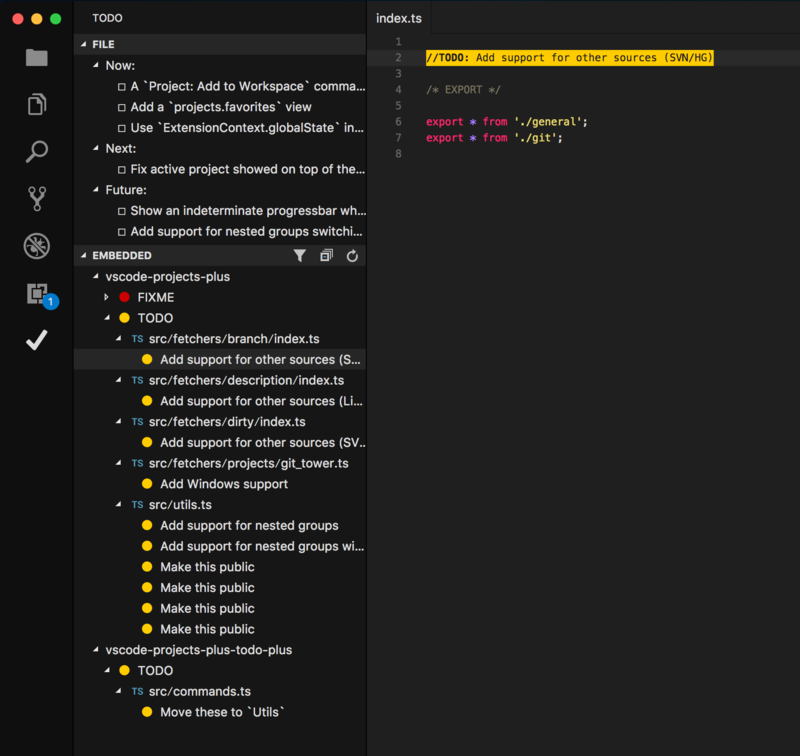 Dark/Light Themes: if you switch between dark and light themes, remember that you can provide specific colors for them via the todo.colors.dark. * and todo.colors.light. * settings, which will override the default todo.colors. * settings. Activity Bar: you can switch the focus to the Todo activity bar view by assigning a shortcut to the workbench.view.extension.todo command. Icons: icons can be used in todo.statistics.statusbar.text. Here you can browse a list of supported icons. If for instance you click the first icon, you'll get a page with .octicon-alert written in it, to get the string to use simply remove the .octicon- part, so in this case the icon name would be alert. alias todo="ag --color-line-number '1;36' --color-path '1;36' --ignore-case --print-long-lines --silent '(? :<!-- *)?(? :#|//|/\*+|<!--|--) *(TODO|FIXME|FIX|BUG|UGLY|HACK|NOTE|IDEA|REVIEW|DEBUG|OPTIMIZE)(?:\([^(]+\))?:?(?!\w)(? : *-->| *\*/|(?= *(?:[^:]//|/\*+|<!--|@|--))|((? : +[^\n@]*? )(?= *(?:[^:]//|/\*+|<!--|@|--))|(? : +[^@\n]+)?))'" Highlight: I recommend using this extension for highlighting your embedded todos. 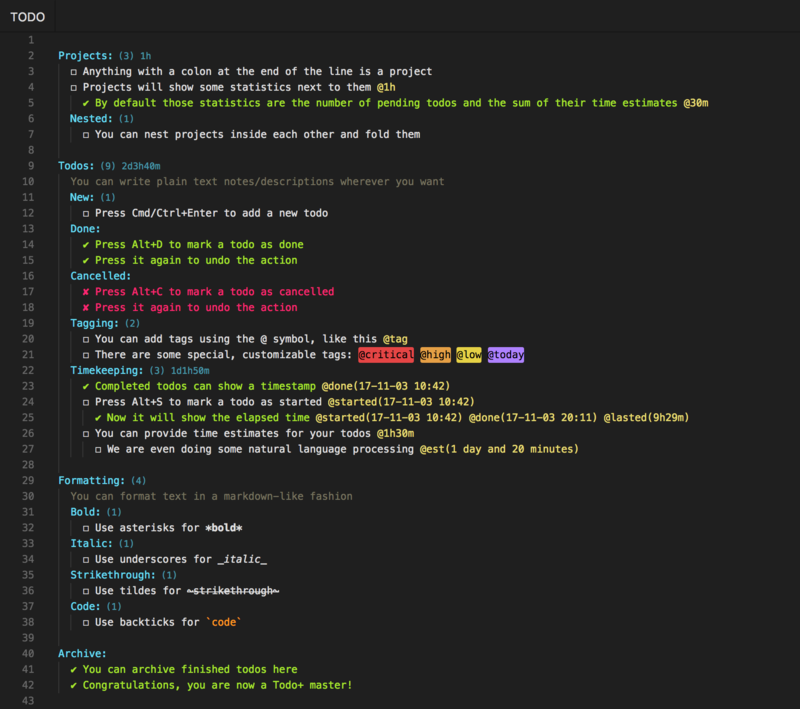 Markdown Todo: Manage todo lists inside markdown files with ease. Projects+ Todo+: Bird's-eye view over your projects, view all your todo files aggregated into one. Noty: Autosaving sticky note with support for multiple notes, find/replace, programmers shortcuts and more. It implements a subset of the functionalities provided by this extension.